Monday, 6 November 2017: Dr Claire Spottiswoode gave a talk entitled Cuckoos vs. hosts: an African perspective. She discussed the co-evolutionary arms races that arise between brood parasites and the hosts they exploit to raise their young, focusing on various African bird species that she had studied in the field in Zambia: cuckoos, honeyguides and parasitic finches (especially Cuckoo-finch Anomalospiza imberbis). First she described how coevolution can escalate to shape sophisticated signals of identity, leading to a race between host egg ‘signatures’ and parasitic egg ‘forgeries’. Then second, how co-evolution can shape ancient genetic specialisation within a single species, allowing the evolution of parasitic ‘gentes’. The research she described comes from a mixture of field experiments facilitated by a large team of Zambian nest-finders, and museum work enabled by the remarkable egg collection of the late Major John Colebrook-Robjent. 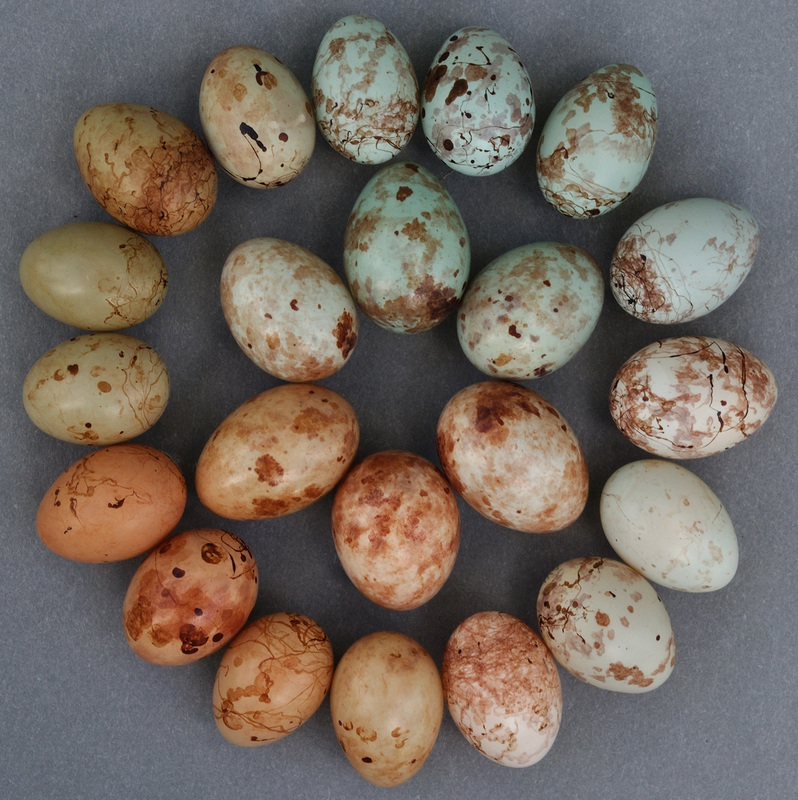 Eggs of Cuckoo-finch (inner circle) and Tawny-flanked Prinia (outer circle). Monday, 18 September 2017: Dr Nigel Collar gave a talk entitled Preparing the Illustrated Checklist: value vs vanity, and provided the following summary. World checklists are necessary but unforgiving confections. International conservation organisations and legal instruments require a list that is at once stable yet flexible, standardised yet sensitive. Using a set of criteria based on degree of phenotypical differentiation, the recent HBW and BirdLife checklist has sought to assess multifarious taxonomic suggestions emerging from the (mostly molecular) literature, but has also proposed a considerable number of novel changes. I called the talk ‘value vs vanity’ because, while there is obvious value in having a world list, it inevitably needs a degree of grandiose self-obsession to take on such a task and a degree of the opposite quality to keep reality in check. I thought of calling it ‘Taxonomy and the Augean Stables’, ‘Taxonomy and the Minotaur’s Labyrinth’ or ‘Taxonomy and the Punishment of Sisyphus’, but these all project a mythical status on the work which is scarcely apposite. Use of the Tobias criteria (Ibis 152: 724-746, 2010) helped the project to confront a significant number of issues which remained poorly researched and resolved. Criticisms of these criteria appearing in various papers as brief but sharply targeted asides can all be answered, including ones relating to the problem of paraphyly. One particular criticism, that the criteria ignore molecular evidence, is unfounded; it is just that there is no way to incorporate such evidence into the system of scoring that the criteria operate. Molecular scientists commonly propound that no genetic difference indicates conspecificity; but cases exist (see plate below) where genetic differences have not been found between taxa and yet the taxa in question are sympatric, so clearly species. Intriguingly, an Australian parrot has now been found to be able to discriminate subspecies by olfaction (Animal Behaviour 95: 155-164, 2014); is this perhaps a clue to the means by which procellariiform seabirds tell each other apart at colonies at night? A recent call has been made for a single world list (Nature 546: 25-27, 2017) to be created through the International Union of Biological Sciences. As it happens, the four current world lists (IOC, ‘Howard & Moore’, Clements, and HBW-BirdLife) are in discussions to see if they can merge, which is generally recognised as desirable so long as uniformity does not stifle independence of thought. That we are on safe ground in this last regard is indicated by the almost-as-recent call to revise the global avifauna according to the Phylogenetic Species Concept (PLoS ONE 11: e0166307, 2016), which is likely to keep everyone on their taxonomic toes for many years yet. 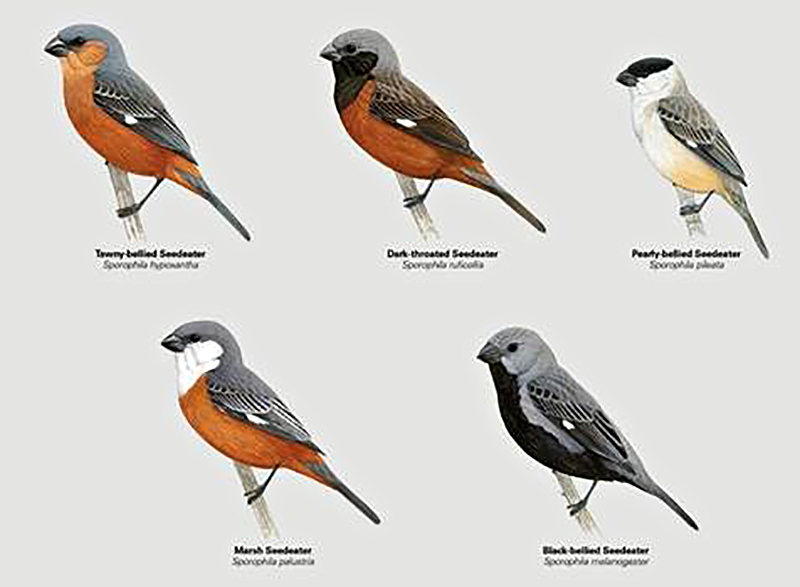 Genetically indistinguishable but geographically overlapping capucino seedeaters Sporophila from southern South America. They can tell each other apart by appearance and song (Mol. Ecol. 24: 4238-4251, 2015). Monday, 12 June 2017: Alex Bond gave a talk entitled Gough Island: an unnatural history of mice and birds. Taking the audience on the journey from Cape Town, South Africa, to Tristan da Cunha and then on to Gough Island, Alex highlighted the plight of the seabirds on one of the most remote islands in the world. House mice Mus musculus were introduced in the 19th century, and now threaten the persistence of many of the island’s endemic species, including the iconic Tristan Albatross Diomedea dabbenena, Atlantic Petrel Pterodroma incerta, MacGillivray’s Prion Pachyptila macgillivrayi, and Gough Finch Rowettia goughensis, and many, if not all, of the ~25 species of breeding birds on the island. Each year, nearly 1 million seabird chicks that would have otherwise survived are depredated by mice, a gruesome fate highlighted in a short film. Thankfully, the eradication of introduced rodents has become a relatively common conservation intervention, and Alex highlighted plans by the Royal Society for the Protection of Birds (BirdLife in the UK) and Tristan da Cunha government to eliminate the rats through the use of cereal pellets with rodenticide broadcast by helicopter. While the challenges in an operation as complex and remote as Gough are many, more than 15 years of research has gone into identifying the solutions to Gough’s remoteness, cliffs, and the potential for non-target mortality. Studies of captive husbandry and clinical pathology of the Gough Finch and Gough Moorhen Gallinula comeri have laid the groundwork for maintaining captive populations during the eradication operation, currently planned for the austral winter of 2019. Finally, Alex discussed the current status of the island’s three breeding albatrosses (Tristan Albatross, Sooty Albatross Phoebetria fusca, and Atlantic Yellow-nosed Albatross Thalassarche chlororhynchos), showing the ongoing declines owing to bycatch in fisheries in the South Atlantic but also highlighting the great strides that have taken place in reducing bycatch off southern Africa and South America. Working north, he ended the talk by previewing work done on Tristan and Nightingale islands to understand declines in Northern Rockhopper Penguins Eudyptes moseleyi, and the comparative populations of Nightingale Finch Nesospiza questi, which numbers 4000 pairs, and the sympatric Wilkins’ Finch Nesospiza wilkinsi, numbering only 80 pairs. Those interested in following the progress of the Gough Island Restoration Programme can visit the project’s website: www.rspb.org.uk/GoughIsland. 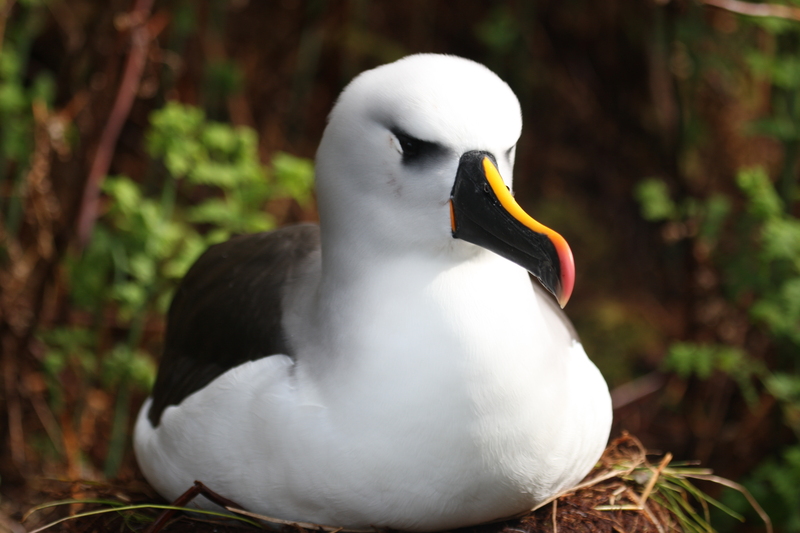 Atlantic Yellow-nosed Albatross—the species most at threat from the ‘super-mice’ on Gough Island. Monday, 13 March 2017: Julian Hume gave a talk entitled In search of the dwarf emu: extinct emus of Australian islands. King Island, in the Bass Strait, and Kangaroo Island, off South Australia, were once home to endemic species of dwarf emu that became extinct in the early 19th century. The King Island Emu Dromaius minor is known from subfossil remains and a unique skin, whereas the Kangaroo Island Emu D. baudinianus is known from subfossil bones, a unique egg, and a contemporary illustration. A further subspecies of emu, D. novaehollandiae diemenensis, formerly inhabited Tasmania, from where it is represented by two skins and a number of eggs, but is virtually unknown in the fossil record. An emu egg shell has also been found on another Bass Strait island, Flinders Island, which suggests that yet another emu species may have formerly occurred there. 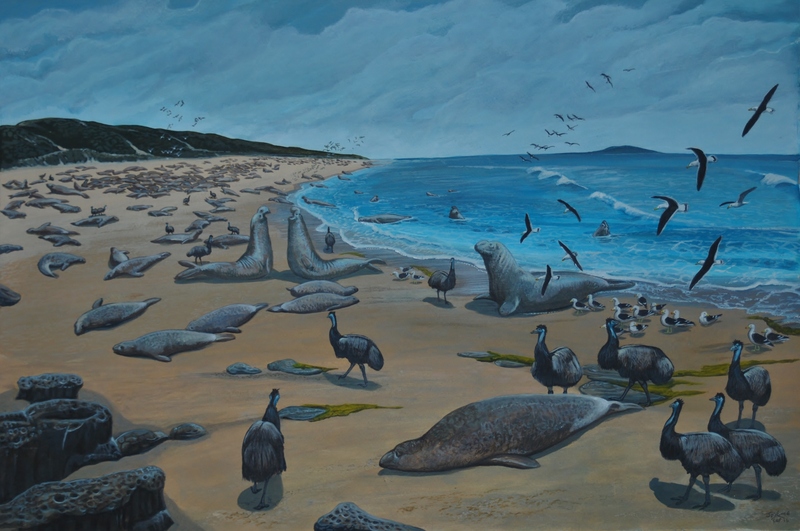 Despite the comparatively large number of emu subfossil remains collected on King and Kangaroo Islands, virtually no contextual data concerning the fossil depositional environments have been obtained. Furthermore, and because of the introduction of mainland emus D. n. novaehollandiae to the Australian islands after the endemic forms became extinct, the reliability of the known skins and eggs, especially those from Tasmania, have been placed in doubt. To overcome this shortfall, Julian travelled to all of the Australian islands to search for palaeontological evidence of emus. On King Island in 1906, J. A. Kershaw undertook the first paleontological survey, and found emu bones in sand dunes in the south of the island. The available results included a photograph of the locality, but Kershaw gave no further information as to its whereabouts. This photograph proved decisive, as Julian and his colleagues discovered the exact site where Kershaw had been 110 years before. Furthermore, other fossil localities were discovered in the west and north of the island, which are the first in-situ recorded examples of emu remains. The visit to Kangaroo Island also proved successful, with in-situ emu subfossils discovered in two cave localities, and one in particular proved to be especially productive; this included beautifully preserved cranial material. Flinders Island was also surveyed, but despite searching the few cave systems and extensive sand dunes, not a single piece of evidence was found to support the presence of emus on the island. It is likely, therefore, that the aforementioned egg shell was probably derived from an imported mainland emu. Finally, and probably most exciting of all, was the discovery of an almost complete, associated D. novaehollandiae diemenensis in a cave by a colleague, Roland Eberhard. This is the first known, and its study should resolve the taxonomic status of this most mysterious of all emu species. Results from the field work, presently being written up, should finally shed light some of the long confusing issues concerning these enigmatic, extinct island forms. An artistic impression of Sea Elephant Bay c. 1804, with Southern Elephant Seals and King Island Emus, as described by the naturalist, François Péron. Illustration by Julian Hume.